This past Sunday, we celebrated six months since the launch of a brand new English service at The Slavic Church | Orange County. It has been exhilarating to see what Jesus has done in just half a year. By some estimates, less than five percent of Russian churches in the United States have launched a fully functioning English service. Because this is such unchartered territory, our only blueprint was the grace Jesus provided, a lead pastor who decided to step out in faith and a dedicated team, full of dreams and visions. The English service was precipitated by a passion to reach our community with the gospel of Jesus. We did not want to be an isolationist community, locked in to one language. We are becoming a multi-ethnic community of faith, speaking the language of our current culture. We want to reach the world around us – in as many languages as possible, with as many services as needed – in Jesus name and for Jesus fame. We wanted to create an environment where our friends, neighbors, acquaintances and co-workers could be invited. We wanted to present the gospel of Jesus in a language that is almost universally understood in our geographical space and context. If we were to continue being a growing church that wanted to remain faithful to Jesus’ mission, the only natural step was to introduce an English service within the context of a Russian church. By God’s grace, this is what we did, six short months ago. With this post, I want to share with you our experience in hopes that it will help facilitate the same transition within your local church. Every context is different. Every church has its own unique idiosyncrasies. Every church has its own specific needs. Every church will have its own timeline by which these changes will begin to take place. Functionally, the outworking of these steps might look different from church to church. But principally, I believe that what I am about to describe can be applied in any ministerial context. 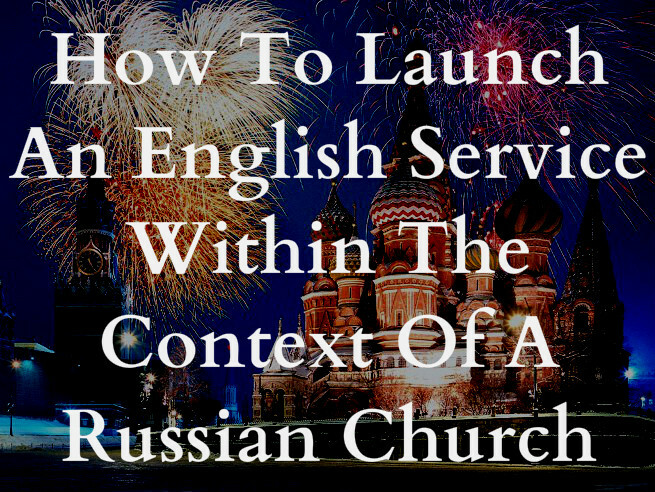 I want to first start with a simple, three part process that can help you in launching an English service within the context of a Russian church. Then, I want to propose and answer the most frequently asked questions you will receive from your congregation, when casting the vision. Finally, I will list a few common mistakes that you, your team and your church can easily avoid during this transition process. Quick disclaimer: This post will be longer than usual. Feel free to grab a lunch or coffee before you dive in. I truly pray that you will use this to make much of Jesus and will see how great our God really is. Ultimately, Jesus built, is building and will continue to build His church. Everything good that happens in the local church is the direct result of Jesus’ generous grace. We are just trying to be faithful servants and steward well that which has been entrusted into our care. For the sake of this generation and the next. Jesus is the Senior Pastor who guides, directs and aligns any process within the church. He is the Redeemer, the Life Giver and the Aligner of all things. After all, it is His church. He loves the church so much that He gave up His life for it. Being unjustly murdered, He was left to die on a rugged cross. The story does not end there. God took Him out of the grave upon the third day and gave Him all authority on earth and in heaven. Jesus was always and forever the Ruler and Shepherd of His people. Jesus wants to use ordinary human beings, within a local church, to accomplish the extraordinary mission of saving people from their sin. Lead Pastor. The only way that I see an English service beginning in a Russian church is when the Lead Pastor of the church is completely sold out for this vision. They are willing to step out in faith. They are willing to face criticism and mis-understanding for wanting to do this. They have a bold and timely call from God, to reach their current culture and context. If the lead or senior pastor within a church is not completely and wholeheartedly devoted to launching an English service, there will be a diluted vision within the church at best or a divided church at worst. Jesus assigns pastors/elders/shepherds to lead the local church. They are responsible for casting vision and leading their people into new horizons. This is why it is absolutely necessary for your lead pastor to desire this vision to come to pass. If they are not ready or are not up for it or simply do not see the reason for doing it, then I would venture to say it will be extremely difficult or next to impossible to prepare your church for this transition. The Bible says that without a vision, people parish. It was also said that without a vision, people will find a different parish. This is the exact description of ninety nine percent of my friends who I grew up with. Because the churches they were in did not have a succession plan to transition into English, they all left to good, Bible-believing, Jesus-loving American churches. There is nothing wrong with that. But no one can deny the exodus. I believe that if Russian churches do not adjust their vision and fit in an English service in their midst, we will experience a second exodus where young singles and young families, will simply abandon the Russian church. Lead Team. If you want to launch an English service, you must have a team in place, prior to your launch date. This includes a lead pastor who will be the primary pastor/teacher, every Sunday. They must be fluent in the English language. Inviting guest speakers, every single Sunday to the English service wont work, because they do not stick around long enough to provide close discipleship, oversight and the simplest form of pastoral care. If your church is small in size, your worship team needs to commit to doing two services, every Sunday. This is more work and time, but Jesus grace is sufficient, wherever His mission is actively present. Lead People. What I mean by lead people is the majority of the people in your current congregation. You must take the time to cast the vision and explain the complexity of the vision. You must take time to answer tough questions. You must create a buffer zone between the planning process and the launch stage. You must meet people where they are at. You can’t just assume people are one hundred percent on board with you – after the first vision casting. Take the time to answer questions. Take the time to ask questions. Take time to properly, gently and concisely – explain your reasoning behind launching an English service. People do not care how much you know, until they know how much you care. Depending on your context, your people might be on board with you after the first time you mention an English service. Conversely, it might take some of you six, twelve, eighteen months, or longer, to even begin to go anywhere. Be patient. God is still actively working in and through your ministry. Just remember, before God will do a great work THROUGH you, He wants to do a great work IN you. After you have the people part in order, you need to dig deep and really provide clarity around the purpose of what you are about to do. What is the reason that you are launching an English service within the context of the Russian church? Is your church ready for this now? Does your church needs this now? What are the implications on your people after launching an English service? What will be the negative repercussions if your church tarries and fails to launch an English service at an opportune time? Do you have a huge heart for lost people in your community? Do you want to reach out and cultivate a multi-ethnic environment, reminiscent of what heaven will be like, when every tribe and tongue will be singing praise songs to Jesus, the King of Kings? Are you ready for the added work, pressure and responsibility of now going to two or more services, in two different languages? What other preparation do you still need to do before creating a launch plan? Does the majority of your current congregation sense a deep urgency to reach the lost world with the saving gospel that only Jesus can provide? Do the people that currently come to your church really have clarity around the purpose of the English service? Have you been diligent in properly presenting and explaining the mission and vision behind the English service? Is your lead pastor the main vision caster and the ministry ambassador to the culture and the congregation? These are all purpose-filled questions that need to be asked, and answered by you, your lead pastor and your entire church congregation. A clear purpose must be attained before taking on such an exciting endeavor. God sees your heart and will see to it that Jesus name will be glorified. During this process of purpose, God might not necessarily do what you would LIKE, but He will most definitively do what you NEED. This is really the nuts and bolts of the three step process. It is a creation of a frame upon which all of the above elements will hang on, so to speak. This has a lot to do with administration. The God we worship is a God of order, not of chaos. As His image bearers, we do well to think through what we do, why we do it and how we are going to do it. Again, this element might look totally different for you, functionally. But I believe that principally, it won’t differ much at all. Finalize space and time arrangements where the English service would take place. Worship leader would work in tandem with main Pastor of English service. We just discussed the three part process of launching an English service. It included Jesus, the Senior Pastor of the church, the people, the purpose and the plan. Why do we need another English service/church when there are so many other American, English speaking churches in the surrounding areas? It is a fulfillment of the Great Commission given to us by our Lord Jesus (Matt. 28:18-20). Biblically, planting new churches is a key evangelism strategy (Acts 14:21-23). In spite of many great English speaking churches in our area, there are still much more people who do not yet know Jesus. In spite of the rise of mega-churches, no county in America has a greater church population than it did ten years ago. In 1920, 27 churches existed for every 10,000 Americans. In 1950, 17 churches existed for every 10,000 Americans. In 1996, 11 churches existed for every 10,000 Americans. There is not a congregation that possesses the ability and the financial resources to attract, reach, and respond to the needs of all the residents of the community. We are in a very unique position, given our background! A majority of people who go to the Russian church are connected with a network of English speaking people who are prime candidates to invite to the English service. Recent research states that there are now 195 million non-churched people in America, making America one of the top four largest “unchurched” nations in the world. Statistically, new churches gain 6-8 times more un-churched people than existing churches. In the U.S., 3500-4500 churches close their doors every single year while only 1,100-1,500 are started. The American church is in the midst of one of the largest mission fields in the world today. Only three other nations—China, India, and Indonesia—have more lost people. There exists a flawed understanding that the United States and Canada are already evangelized. While there is abundant access to Christian information, many unchurched persons in North America are amazingly untouched by the evangelical subculture because the Christian subculture is largely incapable of providing a culturally relevant gospel witness. Are we stopping the Russian church service all together and going exclusively to English? How can unity be preserved if there will be two services in two different languages? We all will have to be very intentional with this. We will share a common leadership, will pray for unity, and carefully nurture whole-church gatherings for fellowship, the sacraments, and times of special worship and celebration, prayer and praise. What should we as a church be specifically praying for? Finally, I want to list a few common mistakes that you, your team and your church can easily avoid during this transition process. Lead Pastor must be bought into and the one casting the vision. If your main pastor in your church does not sense the urgency of launching the English service, it is best to wait upon the Lord. Read this post by my friend Yuriy to decide whether you should leave your church or stay in your church. Holding An English Youth Service On Sunday Evenings Is Not Sustainable. This might be a great alternative for young people to come and hang out, listen to an English speaking pastor/preacher and just be in a comfortable environment. This is however NOT a sustainable model for an actual church service. For an English service to be recognized as a legitimate service that is no less main or primary than the Russian service, it must be done in close time proximity with the Russian service. For example, our church holds the English service at 12pm and our Russian service at 2pm. Both services are back to back. Not Having The Sacraments Present At The English Service. Communion and Baptism must be present at both services. Why would you do a service in English but not observe what the Lord commanded for us to observe? Again, by not observing these sacraments, you are giving off a vision that this is not really a legitimate service, it is just an alternative for young people to hang out at. When you invite friends and co-workers to a service, they most definitely want to feel like this is as primary and as main as any other service that your church has on Sunday. English Service Must Be Multi-Generational Friendly. You need to cultivate a culture where people of all ages are welcome. It is not just for young people. Although more of them will attend since it is a native language for them. A church must be an inter-generational environment, where discipleship takes place and Jesus is being worshiped through it all. My sincere prayer is that Jesus would raise up a generation of pastors and leaders who would be able to humbly and faithfully, navigate this journey of transition – for Russian churches in the United States. I hope this material helps you in some small way as you seek to be faithful to Jesus and boldly bring His gospel to a broken world, in need of radical redemption. Question: Are you a part of a Russian Church? Did you leave the Russian Church? Have you thought about launching an English service within a Russian Church? What questions do you have about actually making it a reality? What are some challenges that you have met along the way? Please post a question in the comments and I would love to answer and help in any way that I can.